There is a lot of wisdom in those few words, especially meaningful to many people in many different walks of life, I am sure, but especially pertinent to those of us who sew. Why so, do you ask? Do you, as I do, plan sewing projects which are transportable when you travel? Can you quite imagine being without needle and thread – or at the least, a book or magazine on sewing or fashion? What do you do when you can’t (gasp!) bring along your sewing machine when traveling far from home? Well, you do what you can, with what you have, where you are…. 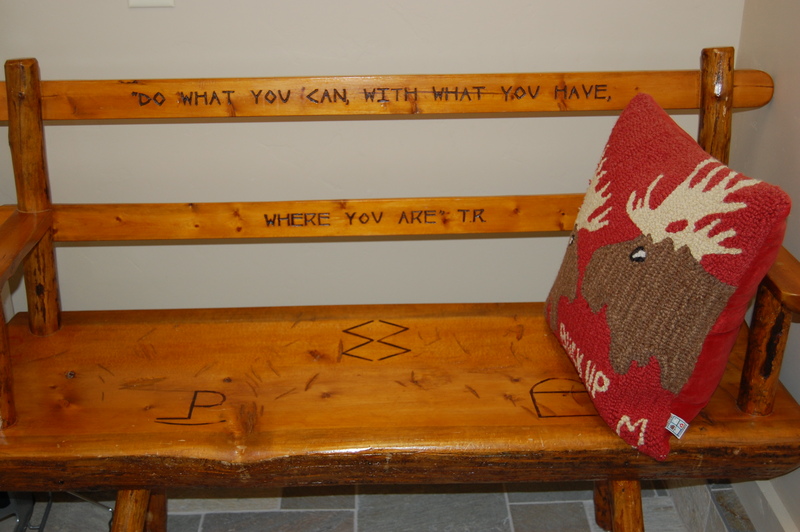 What I knew I could do before we left our home in Pennsylvania three weeks ago for a month in Wyoming – was plan to do hand-sewing on two or three projects. 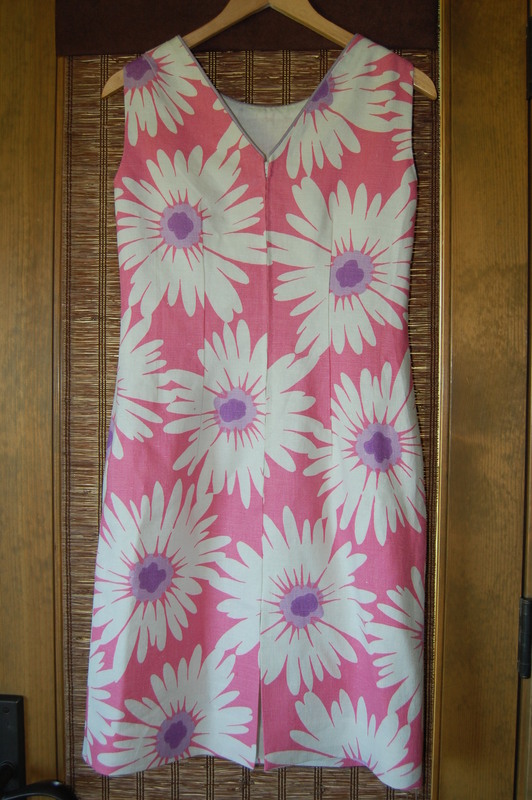 What I had for a “first-project-to-finish” before I departed home (sans sewing machine) – was the unfinished pink-flowered linen dress, started what seems like a lifetime ago. And where I was going to be – had possibility and promise and “best plans” written all over it. The possibility and promise have come in bucketfuls, with days and weeks of family fun: hiking; wildlife-sightings; story times with little granddaughters; diaper changing and laundry; shopping a la Western style; cocktail hour every evening; magnificent mountain peaks, valleys, lakes and rivers; grocery shopping and more grocery shopping; and the list goes on and on. I realized a week into our stay that all my planning for some strategic hand-sewing tucked into these busy days was, well, quite simply, not going to happen – at least not while grown children and little grandchildren took loving precedence! And then suddenly, all too soon, the house was much too quiet, the toys were put away, and while hiking and wildlife sightings are happily still commonplace, my sewing – and my pink linen “not-quite-a-dress-yet” dress – came out to give me a different type of focus. I was scrambling before I left home to get it to the point where I had only the hand-sewn finishing to complete. 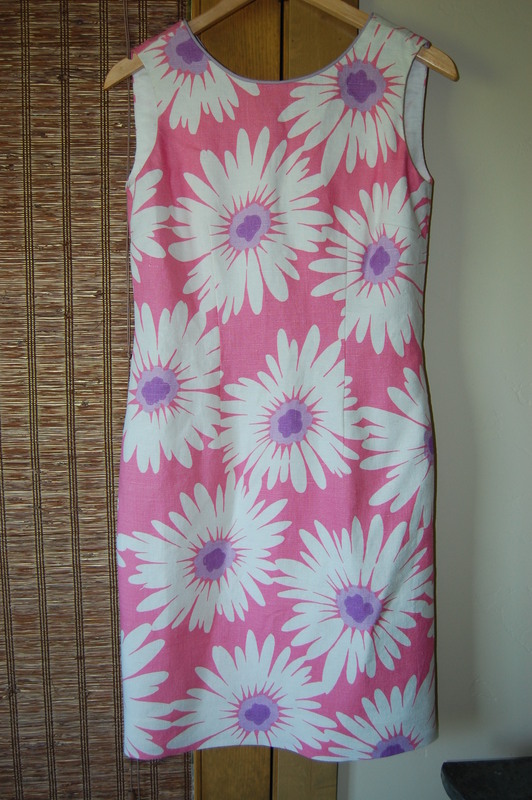 The first challenge I had was with the layout of the sheath dress pattern on that large floral print. The linen is a piece of vintage Moygashel, dating to the late 1960s. By this date, Moygashel was being produced in 45” width, rather than 35”. I have found that it is not uncommon to find center crease lines in the linen from this era, where decades of storage have caused the fabric dye to rub off enough to leave a faint pale line. The fold line – and subsequent faint white line showing dye loss is visible in this photograph. This left me with only one option: I had to place the dress front and the two side backs on either side of the center line of fabric, to avoid that pale line. But I also had to think about the placement of those large daisies. 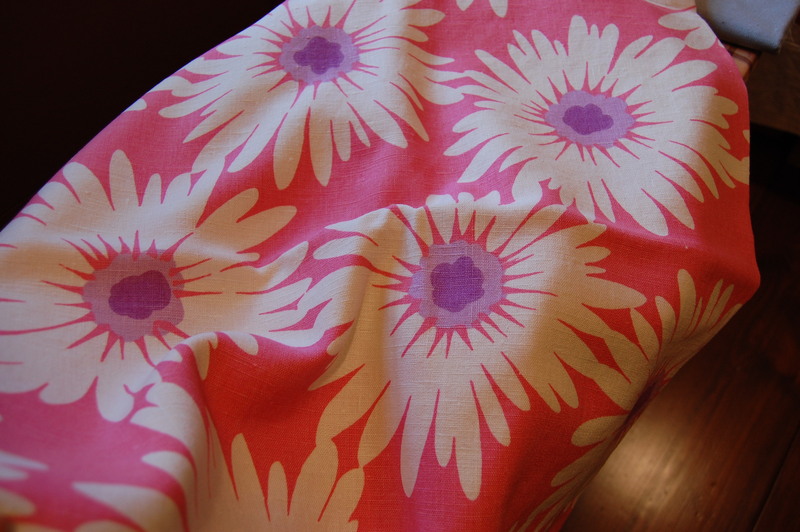 I wanted to try to match the fabric design as much as possible along the center back seam. To accomplish both these goals, I had to line up the front of the dress and one of the side backs, one above the other. (I forgot to take a photo.) It turned out I was a couple of inches short of the length I needed to do this. So – I knew I would need to face the hem. 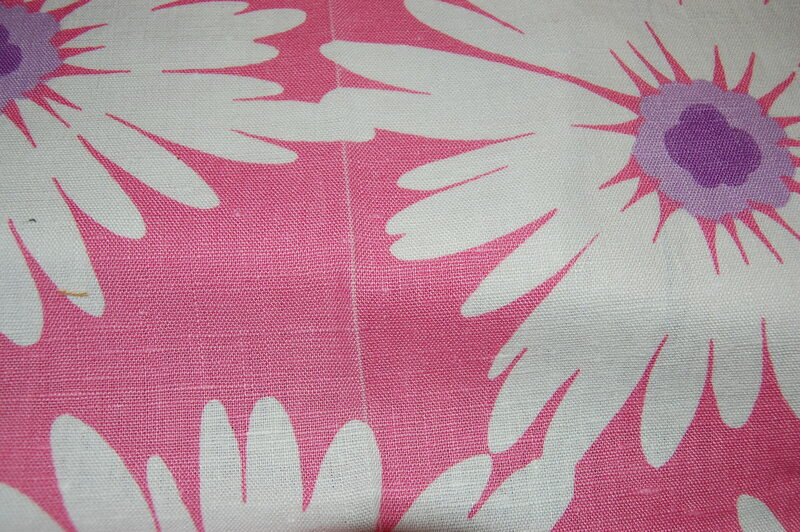 I was fairly successful in matching the flower design along the back seam . . .
Then on to the machine sewing of darts, seams, seam finishings. 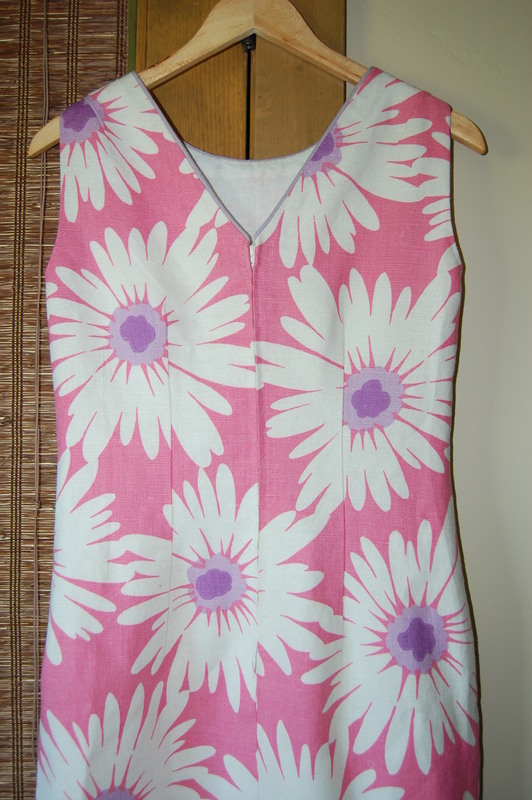 With those completed, I turned my attention to the lavender piping I wanted to put around the neck edge. I used the same cotton kitchen string I had used on my “ghost dress” to use as the filler for the piping. The heavier weight of the linen made the piping more substantial, which is exactly what I wanted. I added piping only to the neck edge. With the piping sewn in place, I could proceed to the zipper. Even though I would be hand-picking the zipper, I wanted to complete it, to double-check the fit before I left on our journey. Then I realized that I had purchased the wrong length zipper! I had picked up a 20” zipper, forgetting that I was adding a V to the back neck. I needed a 16” zipper and had no time to make the trip to JoAnn’s to get a new one. In desperation I searched through my notions drawers and found every color and length of zipper under the sun except a 16” white one. (I’m exaggerating, of course.) Then I looked through a bag of zippers I had gotten from my mother, and lo and behold, there was a 16” white metal zipper, still in its original wrapper. Well, why not? A vintage metal zipper would be perfect for vintage linen. Crisis averted. 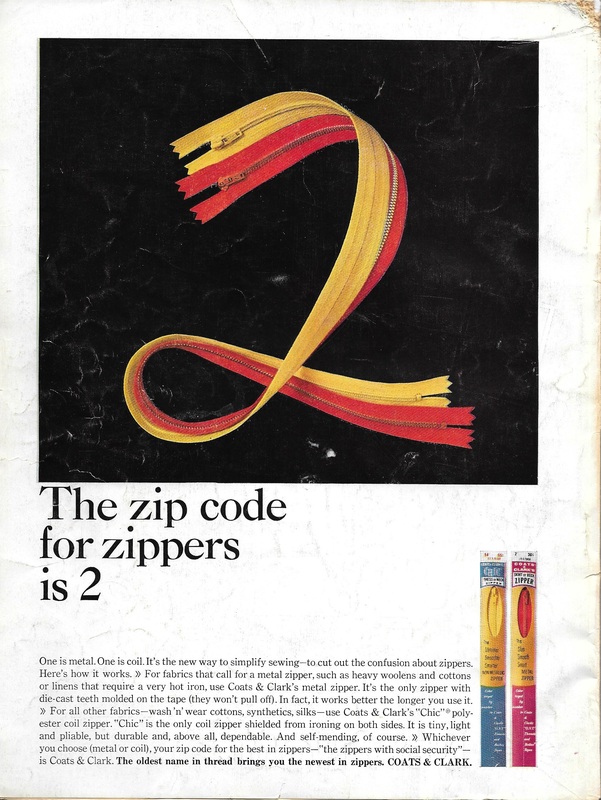 As it turns out, I found this ad for metal versus nylon coil zippers in a 1964 Vogue Pattern Book Magazine. If you read the copy (click on the photo for easier reading), they recommend using metal zippers for fabrics like cotton and linen which require a hot iron. The quality of nylon coil zippers is now such that they can be used for these fabrics without a worry. 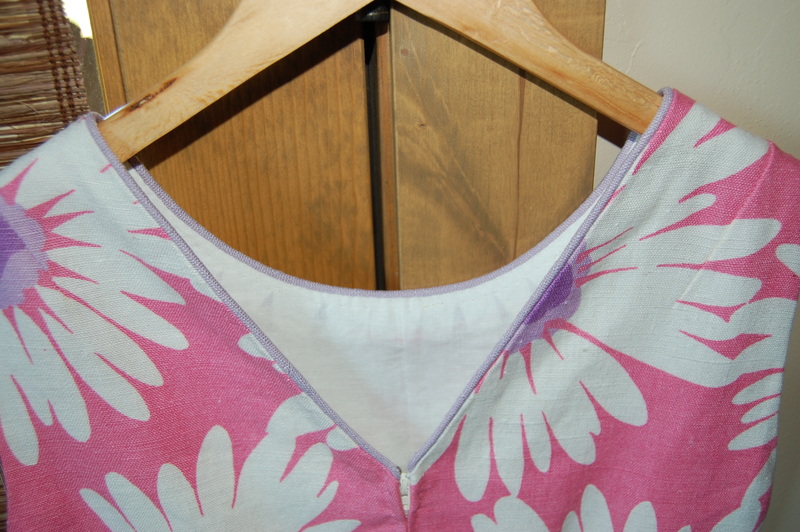 Before I turned my attention to making the lining for the dress, I wanted to address that faced hem. 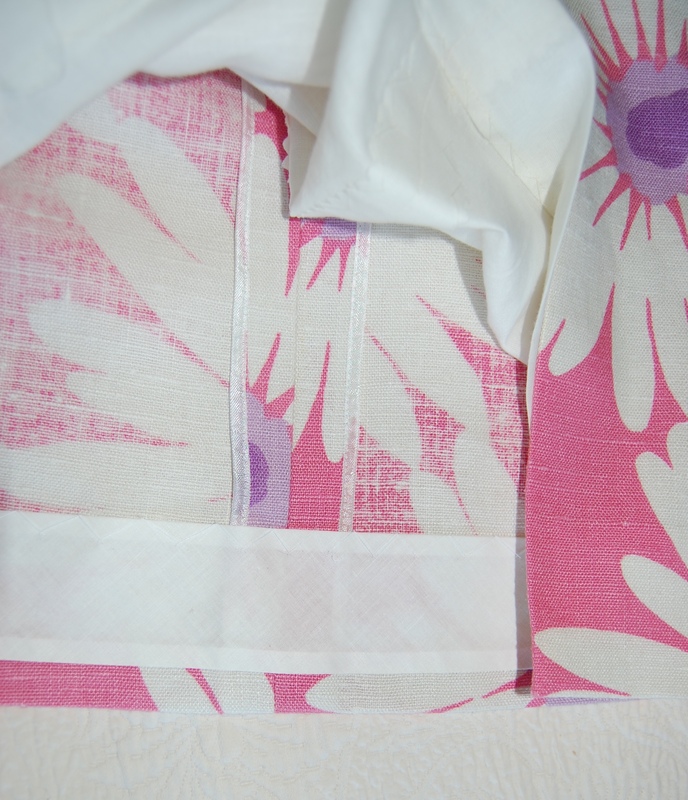 With no time to think about making a facing from the lining fabric, I went back to my notions drawer. Once again, sewing hand-me-downs from my mother came to the rescue! I found this package of white cotton hem facing, which would be perfect for my needs. Look at the price on this! Also, now I am quite sure purchased hem facing would be a cotton blend rather than 100% cotton. The faced hem, plus a view of the seams which I finished with Hug Snug seam binding. Once the lining was sewn, I gathered all the tools and notions I would need to finish the dress by hand. Off it all flew to Wyoming, where finally I finished this flower-powered dress under the expansive Western skies. The front of the dress. No time to get photos of me in it yet, unfortunately! This full photo of the back of the dress shows some more of the pattern matching. I did what I could, with what I had, where I was.